When the weather is pleasant, there is no better way to spend time with your friends and family than hosting a gas or charcoal barbecue. Whether you will be caravanning, camping, or simply firing up your barbecue in your backyard, you’ll be able to enjoy a delicious meal prepared in the great outdoors. Unfortunately, many injuries involving barbecues and outdoor cooking occur each year, but by keeping the following tips in mind, you’ll be prepared to enjoy your barbecue safely. Only light your charcoal barbecue using cold coals with recognised fire starter or lighter. Only use the minimum necessary, and avoid the use of petrol. Carbon monoxide (CO) is produced when a fuel such as charcoal, gas or petrol burns incompletely. This could happenwhen an appliance isn’t working properly or could happen as part of its normal function. 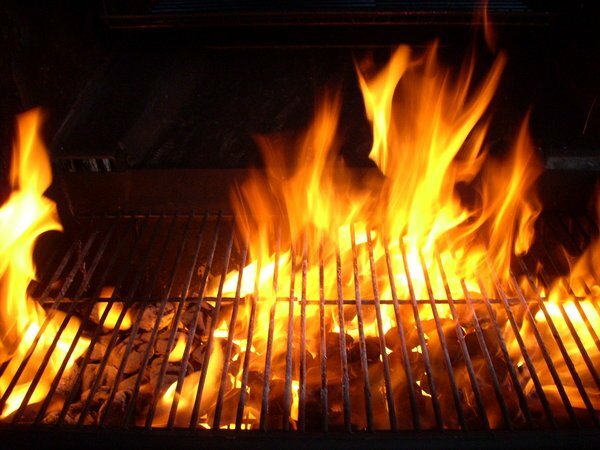 Barbecues, for example, produce carbon monoxide even when they are functioning normally. Carbon monoxide is a colourless, odourless gas and is poisonous. When highly concentrated it can kill swiftly. In smaller concentrations CO poisoning can give symptoms similar to flu or food poisoning. Never take a barbecue inside a tent, awning, caravan or motorhome. Even when cooling a barbecue can give off plenty of poisonous carbon monoxide (CO), which can kill. Never use a fuel-burning appliance as a heater for your tent or awning. Kerosene and gas heaters – unless they are permanently fitted in a caravan or motorhome – should only be used outside, never inside. Stoves and barbecues are designed for cooking not space heating. Never operate a gas, petrol or diesel-powered generator inside of your caravan, motorhome, tent or awning. Never cook inside your tent or awning. Consider purchasing a carbon monoxide (CO) alarm, provided it is suitable for the condition you intend to use it, check with the supplier/manufacturer, though it should never be used as an alternative to the precautions above. You cannot smell, taste or see carbon monoxide but it can kill quickly and without warning. The early stages of carbon monoxide poisoning can present symptoms similar to food poisoning or flu, though without a high temperature. Symptoms to look out for include: Headaches; dizziness; feeling sick; Fatigue and confusion; stomach pains or shortness of breath. Higher concentrations can present more severe symptoms:Symptoms appear similar to intoxication; vertigo, the sensation that everything is spinning; loss of coordination; shortness of breath and increased heart beat rate; seizures or unconsciousness leading to death. But the best advice is to avoid any chance of being poisoned in the first place.